There are two ways to eliminate a gap between teeth, created by a missing tooth or teeth. One way is through dental implants; the other is through a bridge. A bridge is made up of at least two crowns for the teeth on both sides of the gap — these two or more anchoring teeth are called abutment teeth — and a false tooth or teeth in between. These false teeth are called pontics. Dental bridges are supported by natural teeth or implants. Why would you have a bridge done? The first four reasons are rather self-explanatory and most often used by patients as a rationale to have a bridge done. The last reason on the list is quite often overlooked, even though it is a very important one. The teeth adjacent to the gap created by missing teeth tend to shift with time. It might look like the remaining teeth are shifting to close the gap. What really happens can be seen only in the x-ray picture, which shows what is going on below the gum line and inside the jawbone. 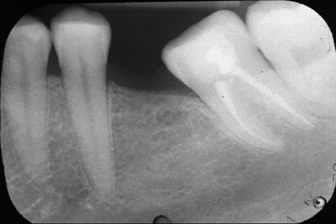 The x-ray reveals that the root of the shifting tooth is pressing against the root of the tooth located next to it. And, in accordance with the laws of physics, the more chewing is done, the more pressure is exerted. As a result, both roots are being damaged. This fact alone is a very good reason to consider having a bridge done. During the first visit for getting a dental bridge, Dr. Kinga will prepare the abutment teeth. The preparation involves recontouring these teeth by removing a portion of enamel to allow room for a crown to be placed over them. Next, impressions of your teeth will be taken, which serve as a model from which the bridge, pontic(s), and crowns will be manufactured by a dental laboratory. During the second visit, Dr. Kinga will check and adjust the new bridge as necessary, to achieve a proper fit. Multiple visits may be required to check the fit of the metal framework and bite. This is dependent on each individual's case. The bridge may be temporarily cemented in place for a couple of weeks to make sure it fits properly. After a couple of weeks, the bridge will be permanently cemented into place.